Within each Middle and Upper School grade, advisors work with students to achieve specific goals, preparing them to succeed in subsequent grade levels. As soon as a student commits to Kingswood Oxford, he or she is connected to an advisor, who serves as an advocate for the student and family. In addition to overseeing a student’s academic progress, advisors also provide informal and personal guidance in all areas of school life. They collect and receive information from faculty about advisees and serve as a liaison between parents and the school. In many ways, advisors function as “life coaches” — they see what happens in the hallways, on the sports field, in the classroom, and more. They use this “big picture perspective” to guide and support all aspects of a student’s life: academic, athletic, social, and extracurricular. Advisors stay in close contact with students and families. Advisors and advisees meet frequently, enabling them to form deep and trusting relationships. Students meet with advisors in small groups three times a week, as well as individually. 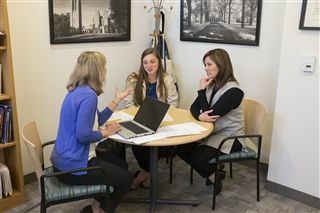 Advisors connect with parents via email and phone. Conferences occur twice a year to discuss student progress and to set goals. Students are active participants in the conferences, contributing to their sense of responsibility, empowerment, and self-advocacy.